Win an Audi Q5, Mercedes CLA or BMW Z4 - you decide, PLUS your share of £125,000! There's over 3,000 fantastic prizes to be won, and no limit to the number of prizes you can win! Plus, you will get a £175 casino bonus! Find here all the details! Get your Tickets for Free! Get your 1st FREE TICKET by opting with your BetVictor registered account details*. Opt-in - Simply opt-in to the promotion to earn your first ticket for free! Deposit - Your first deposit within the promotional period will earn you a second free ticket! Play - For every £50 wagered on any of theirr 300+ slots you'll earn an extra ticket. And keep a look out for their upcoming Double Ticket Days, Triple Ticket Slots, and many other ways to get ahead of the game! This promotion starts on the 23rd August 2013 at 00:00 GMT+2 and runs until the 25th September 2013 at 23:59 GMT+2. Only players opting–in by submitting their BetVictor username and registered email address will qualify for this promotion. Opting into the promotion will earn you 1 free ticket into the draw. Your first deposit made after opting into the promotion, and within the promotional period, will earn you 1 free ticket into the draw. Every £50 wagered on any of our slots during the promotional period will earn you 1 ticket into the draw. Wagering will be calculated from date of opt-in. The prizes and wagering amounts listed are the same for GBP, EUR and USD. Currencies other than GBP, EUR & USD will be converted to GBP from the current exchange rates. (e.g wager £/$/€50 on any of our slots during the promotional period to earn 1 ticket). This promotion is open only to the residents of those jurisdictions where participation is legal. This promotion is only open to customers who are over 18 years of age. Only those customers playing with real money are eligible for the promotion. Playing as a guest or for fun does not contribute to the eligibility of this promotion. By opting in to this promotion, you agree to receive details of special offers, free spins and other promotions. For the purposes of this promotion, a weekly period will run from a Friday at 00:00 GMT+2 to Thursday at 23:59 GMT+2 inclusive, with the first week being from the 23rd to 29th August 2013. The last weekly prize draw for this promotion will be held on the 20th September 2013. Any tickets earned in the week prior to the weekly draw will be included in both the relevant weekly draw as well as the main draw on the 27th September 2013. At the end of the promotional week, your number of tickets earnt during that week will be doubled if you wager over £50 on the qualifying slots a minimum of 3 separate days during the promotional week, and your number of tickets will be trebled if you wager over £50 on the qualifying slots on all 7 days of the promotional week. Residents other than those of UK & Ireland will win the cash equivalent of £30,000 if they are drawn out as the winner of the main draw held on the 27th September 2013. The weekly prize draws will be held on the following dates (30th August & 6th, 13th, 20th September 2013). The weekly prize draws will consist of the following prizes: 1st to 25th - £50 ; 26th to 87th - £20 ; 88th to 212th - £10 ; 213th to 462nd - £5 ; 463rd to 712th – 10 Free Spins. The Main Prize Draw will be held on the 27th September 2013. There will be no transferring of prizes. Prize winners will be drawn at random. If prize winners can not accept the prize or can not be contacted BetVictor.com are entitled to redraw and award the prize to another recipient. The main draw held on the 27th September 2013 will consist of the following prizes: 1st prize - Choose between a Audi Q5, Mercedes CLA, BMW Z4 or the £30,000 cash alternative ; 2nd Prize - £15,000 ; 3rd and 4th - £5,000 ; 5th to 9th - £2,000 ; 10th to 19th - £1,000 ; 20th to 69th - £200 ; 70th to 169th - £100. All cash prizes and free spins will be paid into the prize winners BetVictor account within 2 working days of the draw being made. Any player whose account is closed will not be eligible for any prizes. Any tax payable or insurance needed as a result of a prize being awarded or received will be the responsibility of the prize winner. Prize winners should seek independent financial advice prior to accepting a prize if this is a concern. Prize winners may be required to participate in photo or video sessions. By accepting a prize in this promotion, you agree that BetVictor has the right to use your name, location and photos in any of our marketing material. The terms and conditions and the qualifying games where the free spins can be used can be found here. BetVictor reserves the right to disqualify players from the draw, or prize winners from receiving their prizes where any such person is ineligible for any reason or engages in unsafe, illegal, unsociable or inappropriate behaviour. BetVictor reserves the right to withhold any prizes or bonus payments if it believes that the promotion has been abused and/or where the terms of the offer are not fulfilled, or any irregular betting patterns are found. BetVictor reserves the right to withdraw or amend this offer at any time at our sole discretion and without prior notice. In all matters related to this offer, our decision shall be final and binding. BetVictor reserves the right to suspend / terminate any prize draw at any time if it has reasonable grounds for doing so, which may include without limitation a prize draw (or the website on which it is presented) being subject to, or affected by, any denial-of service (DOS) attacks, bugs, viruses or any other technologically harmful material or act of hacking by a third party, or in the event of any wilful attempt to breach these terms and conditions. As a condition of your entry into any prize draw, you agree to indemnify us and our affiliates, officers, employees and agents from and against any and all liabilities, other expenses (including costs and legal fees) and damages arising out of claims resulting directly or indirectly from such entry. BetVictor cannot guarantee the prize shown will be the same as the prize awarded. All images of prizes are for illustrative purposes only. 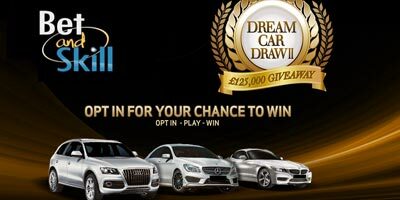 "BetVictor Casino Dream Car Draw II: win an Audi Q5, Mercedes CLA or BMW Z4"